Galley Wench Tales: New Zealand -- Wheels! This is what fit our budget. Mom - this is a "Hot Wheels" not the real deal. Yikes! How did we go from arriving in New Zealand with 5 months to enjoy it to -- we gotta do the whole "Long White Cloud" in less than a month? New Zealand's coastline totals 165,906 miles. We kicked ourselves for passing up a nice looking $1,000 NZ sedan we saw the first week we arrived in New Zealand at the KeriKeri Saturday Farmer's Market. It sold within 24 hours of when "Dad" posted the for sale sign on his son's car. We just weren't ready yet. After all, we'd arrived less than a week prior and nice as it would've been to have a car in the Bay of islands, we were moving our boat around a lot and would've been challenged with how to coordinate our car's movement with it. Besides, ideally we wanted a van -- if we could afford it -- or a station wagon. We wanted something if we needed to we could sleep in. So we waited, while the low end cars got snapped quickly up by other cruisers and Kiwis who know a good bargain when they see one. (ex. camping in a torrential downpour) was not an option. We followed up with a private seller, on a tip from a fellow cruiser. The seller was nice. The price was low. The car, scary. 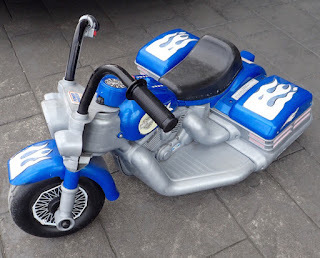 We looked at Cars for Cruisers; we'd read about them on other cruiser blogs and the convenience of having our seller buy back our car was appealing. However, what we saw for sale either struck us as overpriced -- and there was definitely a chunk o change left on the table on the buyback -- or far too iffy to look like we could trust it on a long road trip -- or both. So we kept looking. "TradeMe," New Zealand's hybrid answer to Craigslist + eBay, was the most frequent suggestion on where to hunt. Again, when we were ready, we weren't crazy about our options. We checked Turner's Auto Auction. Again, when we were ready, we weren't crazy about our options. So nearly any chance we chatted with locals -- at the marina, with newfound friends, at the dentist -- I asked for suggestions. "Kamo is a place where they park cars to sell by owner," suggested Michelle, the helpful dental receptionist, among a list of other suggestions. Googling it, I came across Free to Sell; a dealership that's more a hybrid between a used car dealer and private sellers. 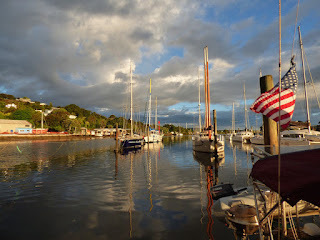 It was in easy walking distance of Whangarei Town Basin Marina. Happily, Free to Sell seems to be the best blend between dealer and private seller. Car prices are a reasonable value, with a decent range of options. Buying from a dealer offered us the assurance New Zealand's required warranty of fitness (WOF) was current. The registration and licensing was done for us as well, included in the price. Our list of stuff to fix - a screw in the tire, antennae that didn't work, car alarm that was a bit quirky, was fixed before we left the lot. Fingers crossed the broken struts that hold the hatchback door open is there when we drop by later this morning (ordered - didn't come in prior). 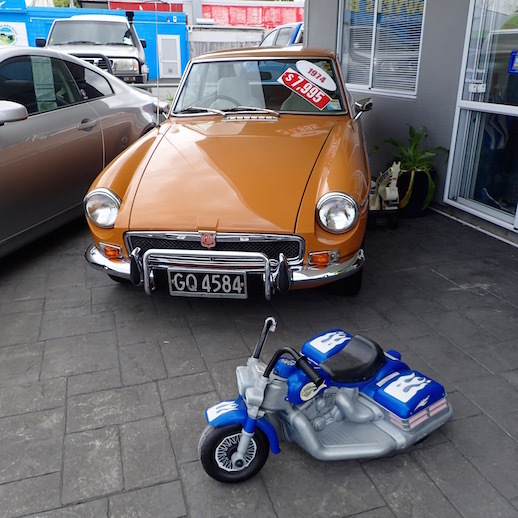 New Zealand's lemon law applies easily when buying from a dealer, but if buying from a private party, that's far dicier. Our wheels for the next 3 months in New Zealand. 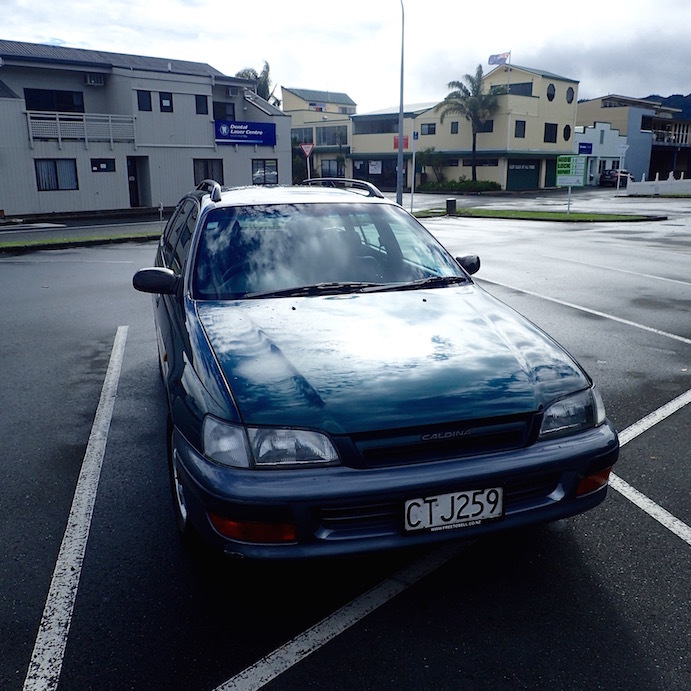 Arthur, Northland's Free to Sell owner, struck us as refreshingly honest and accommodating. 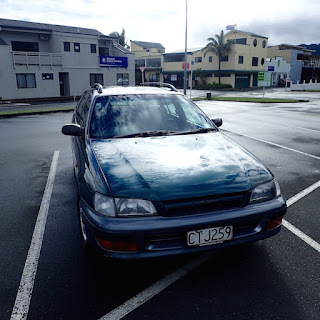 He steered us away from a sedan that had some issues (Wayne, as a mechanic knew what they were), and a toward a 1996 Toyota Cadena wagon, at $2500NZ ($1640 USD) complete (fix, WOF registration, licensing) only a few hundred more and far better suited to our needs. Plus, whether we return to Arthur to sell it for us when we leave, or sell on our own, it should be much easier to sell the the V6 Ford Fairmont sedan we originally considered, and we'll get far better gas mileage while we are driving it. Arthur even tipped us off on saving a couple hundred dollars by pre-purchasing our ferry to South Island ticket. Ok, time to stop writing and get packing! Wish us luck driving on the left (or, Wayne claims, "wrong") side of the road. As Dustin Hoffman said in Rainman, "I'm a very careful driver." And Wayne is. at Whangerai's nearby Riverside Marina for a haul out. This post was written the morning we left our pile mooring at Whanagarei (S35.42.573 E174.19.793). Upcoming posts will be a mix of cruising catch-up and road trip adventures. 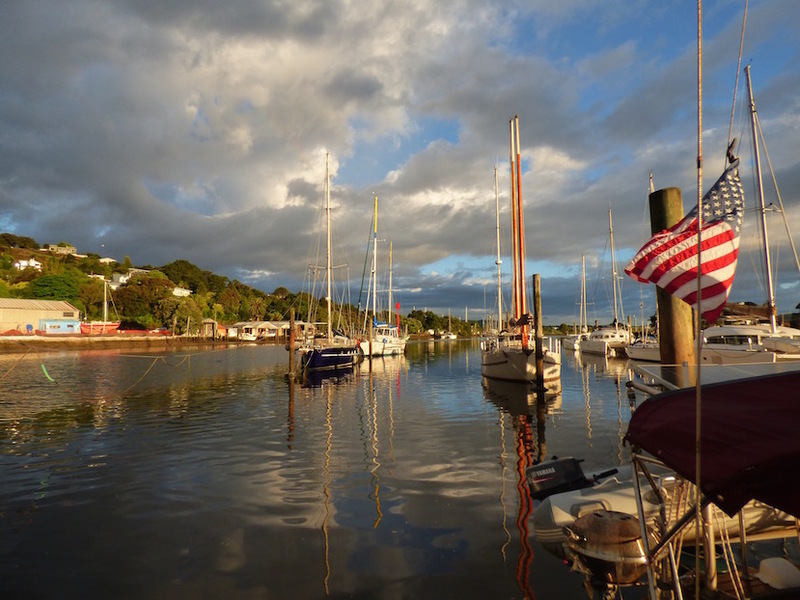 From December 2014 to November 2015 we sailed over 10,000 miles from Florida, USA to Bay of Islands, New Zealand. We made more than a few stops along the way. Still - way too much time under passage for our taste! Since arriving in New Zealand we've cruised less than 200 miles in our boat, but will resume cruising in our Pearson 365 sailboat when cyclone season ends.